I write this blog after returning from a crowded funeral. For the past few weeks I have been coming to terms with the tragic death of Jonathan Lee. A local business owner and all round fantastic guy. At the age of 36 he has been taken from us far too early. He leaves a Lancashire marketing agency in his stead and a beautiful young family. I write this blog post today in recognition of his part in the start-up of Lucky 6 Marketing. He was our very first client. Way before anyone else he took interest in our service and offered us help. I am in no doubt that his assistance in those early days significantly aided Lucky 6 Marketing to develop as it has. It was 2012. That year the iPhone 5 was released, Google launched their Project Glass (later to become Google Glasses) and 4k TV had just been rolled out. It was also the year I met Jonathan. Lucky 6 Marketing was still in its very early days and I was working on the core concepts and pricing for a social media management service. Something nobody else was doing at the time. I figured there was no better way of testing such a service than generating my own clients. So, I took to Twitter, connected with as many local businesses as I could and promoted this new service. For a long time I received nothing back until I received a Tweet from a guy at Bright Red Media. This turned out to be Jonathan. He invited me down to his office to discuss how they could potentially use this service and offer it to their clients. I didn’t know it at this point but this was going to be a defining point in the life of Lucky 6 Marketing. I can still remember the Bright Red Media office back then. I remember thinking it was so cool. They had a foosball table in the centre of the room and Macs on every desk. I was working from my front room at the time so the idea of having your own office was just incredible to me. Here was Jonathan with his very own office. I was inspired. During that first meeting Jonathan took his time to examine the services I had planned. He probed and questioned different aspects and even told me to put my prices up. I have been in business six years since that meeting and can tell you that it is exceptionally rare for someone, especially someone you are selling to to help you in such a way. I tweaked the service following that meeting using Jonathan’s recommendations. I remember feeling energised for weeks after that such an established business man had taken such an interest and offered advice to a beginner such as I. Little did I know it was the beginning of my journey. I had further meetings with Jonathan and began working on the Bright Red Media Twitter and Facebook accounts. He introduced us to another marketing agency called Voodoo Agency. They became our next clients and in turn we worked with some of their clients. Jonathan also introduced me to a Mechanic friend of his called James. Soon after I was managing James’ social media accounts. 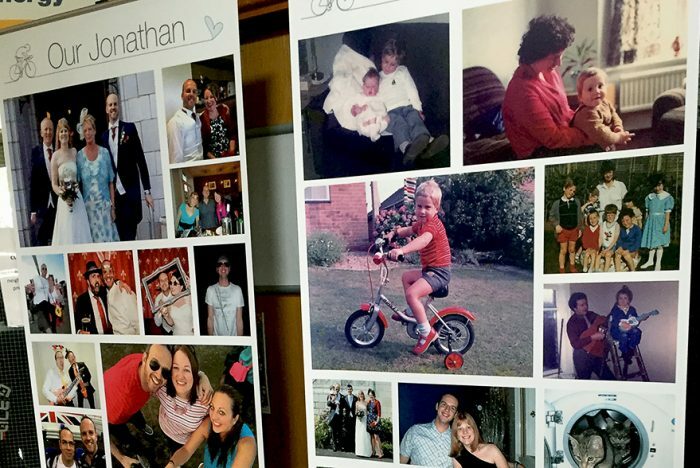 By the following year, we had our first selection of clients many of which had direct ties to Jonathan. This was the beginning of Lucky 6 Marketing. With real world practical social media work I was able to adapt and develop our social media management service. Eventually, after a year or so, we drifted from Jonathan and Bright Red Media. We won clients elsewhere and continued to grow the company. Our paths would cross on occasions, he would ask about our service and how he might be able to use it and he would always offer his advice. Most recently we were talking about offices as he was interested in moving onto Clifton Fields but he ended up taking an office in Kirkham. It is rare you meet anyone with the qualities Jonathan possessed. He inspired me, gave great business advice and made it look so easy. He was a true professional and a great person. He will be a great loss to the Lancashire marketing sector and I will miss him greatly. However, I am comforted to know he leaves such a strong legacy by the businesses he worked with, friends he inspired and family that he dearly cared for. He may have left us under tragic circumstances but he leaves our little corner of England a much better place than when he came into it. I will be inspired for the rest of my life by his achievements and outlook. He was such a positive role model and I am sure for many of us he will continue to be far into our lives.